As the weather was reasonable and we had spent the weekend indoors completing our Inn Way report (yes it's finished! - click here to read all 9 days and recommended B&B's in the Lake District) we decided to get outside and find a few geocaches. Looking on the website there were a few new caches set up that we hadn't been too, and we could also combine visiting them with checking up on some caches that a friend of mine owns. First we headed to Ixworth Thorpe and had a short walk along a farm track and through some woods to get to the site. This seemed a popular path with runners, several times we were passed as we hunted for the cache container just off the footpath. Eventually I found it and we filled in the log book. Next stop was Ampton Water where we did our first check on my friend's cache. It was still well hidden and the container was full of things to swap. The cacher who set this one up likes creating unusual hiding places. 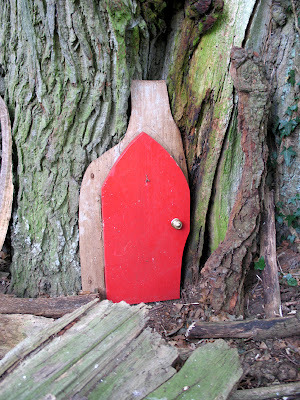 Another later in the day wasn't anywhere near so obvious as a bright red door in a tree! 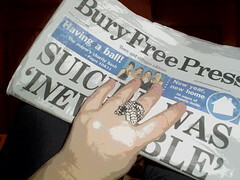 Again the name contained a clue - 'Not Mush Room' - therewas only space in the 'container' for a slip of paper to sign. We then enjoyed a good walk around Knettishall Heath, performing another maintenance check there. This cache hasn't been found for 6 months as it requires some work to find out where it is hidden. Finally we dashed over to Brandon Country Park and had a very quick walk around a route there to check on the third of my friend's caches. The log book in this one was full as it's a very popular spot, so we put in a new one. According to the GPS we totalled up a little over 7 miles in all of our short walks, so not bad for an afternoon. 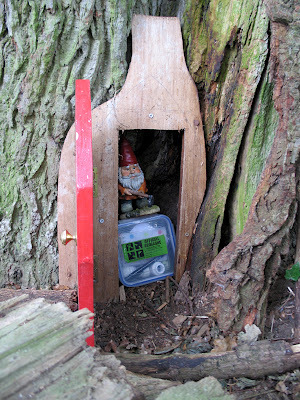 I lover the gnome cache!! I had no idea such a hobby existed - what fun!